Alexander Stewart. Pic by Chris Sumner. Alexander Stewart travels between his home in Inverallochy and the blood transfusion centre at Foresterhill in Aberdeen. The Army veteran uses the Stagecoach 68 service to get from Fraserburgh to the city to get into work and home again in the evening. He uses the 69 service, which connects Fraserburgh to Peterhead via Inverallochy, St Combs, Crimond and St Fergus, to make sure he can catch the connecting bus into Aberdeen. But from next month Mr Stewart’s evening journey home to Inverallochy will be disrupted when the changes are introduced. From April 15 the last bus from Fraserburgh to Inverallochy will leave the town at 6.30pm, some 40 minutes before Mr Stewart is due to arrive from Aberdeen. Mr Stewart fears the change will force him to slash his own working hours leading to a potential pay cut. He said that is something he can “ill afford” and fears other people will may lose their jobs if they unable to travel to work. The 52-year-old compliance officer said: “I finish a 5pm and I’ve got to get the bus from Aberdeen. “The first bus I can get from the city is at 5.30pm, but the last bus to Inverallochy leaves almost an hour before I arrive in Fraserburgh. “It seems to be a bit of a shambles and people are going to lose their jobs over this. 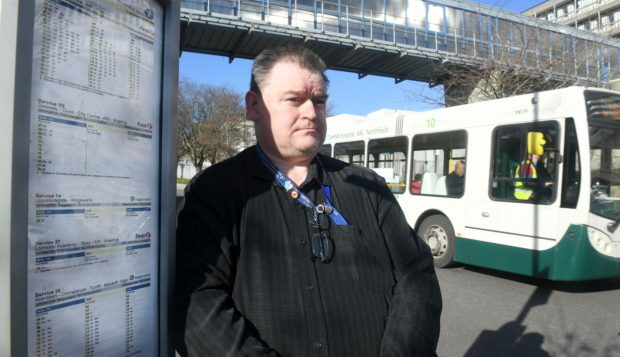 Mr Stewart has raised the issue with the council and said a representative from the passenger transport unit told him there was not a lot the local authority could do to help. Neil Stewart from Aberdeenshire Council said a bus will leave Fraserburgh at 6.50pm so it meets the arrival of passengers on the 5.15pm Aberdeen to Fraserburgh service. The number 69 travelling between St Combs and Fraserburgh after 6.30pm during the week is one of 29 services being either completely axed or replaced with a dial-a-bus option. The local authority decided to reduce financial support for the bus services which provided least value for money.